Imagine the ingredients for a perfect career — as an independent filmmaker, or in any field: creative control, enough success to keep working, the occasional critical or box-office hit, and a little recognition from your idols. 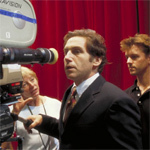 If that’s the ideal, then Mike Binder has it all: he makes a movie about once a year, he’s hit it big with The Upside of Anger and Reign Over Me, and while talking about his latest project, he was interrupted by an unexpected call from Mel Brooks. Reign Over Me hit video store shelves this fall, but Binder’s latest project is actually a different DVD release. In 2001, Binder finished The Search for John Gissing, a screwball comedy starring himself, Janeane Garofalo, and Alan Rickman. Binder and Garofalo play Americans arriving in London. Binder’s character is here on business to close the biggest deal of his career. Rickman plays an officer at the company’s London office whose own career will be in jeopardy if Binder gets credit for the deal, so he deviously tries to cut Binder out of the loop. The film played at festivals to good reviews in 2001, but that was as far as it went. “We couldn’t get a good distribution deal,” says Binder. The only offers were insults that would have forced Binder to give up ownership of the movie. Fast-forward to 2007. Fans of Alan Rickman had been demanding a DVD of Gissing. Binder’s production company had done well enough producing movies, so they opted to self-release the DVD through their production company at TheFreeBird.com. “We’re just doing this ourselves,” says Binder. “I want to build to the point where I can distribute my own movies.” It’s a risk he says he hasn’t seen anyone else take. Whatever the critics say, Binder seems to have a career many young filmmakers — or most anybody — would die for. “I like to make a movie every year,” says Binder, who has been able to do just that. And before he can elaborate on why that’s a dream come true, he has to take a phone call from one of his idols.